A primary school teacher has pled guilty to charges of serious professional incompetence. Susan Barnard, 55, was the first person to appear before the General Teaching Council for Scotland on such a charge. She now faces being struck off after admitting failing to manage pupil behaviour and plan lessons. Perth and Kinross Council sacked her amid concerns about her performance at Coupar Angus, Comrie and Arngask primaries between 2003 and 2006. Her lawyer said she was doing supply work for another council and hoped to keep her teaching registration. Andrew Gibb said: "Clearly she's extremely concerned about what the future holds for her." He said she hoped to present compelling evidence in mitigation, which will enable her to keep her registration. 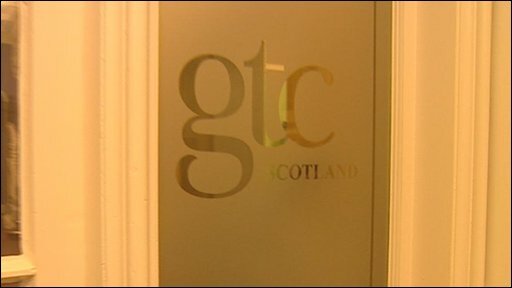 Robbie Burnett, lawyer for the regulatory body GTCS , told the committee on Friday that "despite significant management support over an extended period of time to address areas of concern", Ms Barnard had failed to meet the standards required in her performance. A hearing on 3 December will determine whether she will be the first teacher in Scotland to be struck off for incompetence. Susan Barnard admitted failing to manage the behaviour of pupils. Removal from the register prevents teachers from taking jobs elsewhere. Until now teachers have only been struck off for serious misconduct, for behaviour such as siphoning off school funds or forming an inappropriate relationship with a pupil. But a change in legislation in 2006 allowed the profession's regulator to hold disciplinary hearings on incompetence. Gordon Smith, from the Association of Headteachers and Deputies, called for more cases to be brought forward. He said that until now, if a teacher was deemed incompetent, they were merely moved to another school because of the "complex and sometimes Byzantine" process of bringing a case against them. He said: "I wouldn't wish this on anyone but we have to realise this is an issue in Scottish education that perhaps we've ignored. "If you were an employer with nearly 50,000 staff, you would probably assume that 1-1.5% had competency difficulties, so for this to be the first case to come forward is surprising for everyone. "Imagine it was your child that was in that class and a teacher with 10 years' experience will have perhaps ruined the education of 300 children." In England, about 10 teachers a year are charged with alleged incompetence by the GTC.